Homes are almost everyone’s largest investment, but they are much more than that. A home is also the background to our experiences and memories, and they are the physical basis for life’s daily patterns. When the realization comes that a home doesn’t meet our needs, fit with our sense of aesthetics, or isn’t as energy-efficient as is appropriate for today, it launches a series of decisions. Fortunately, local architects and designers have experience, training, and even checklists to walk homeowners through these choices. With the new Blaine County and city energy standards, a remodel must perform better, and Jeff Williams recommends a blower test early on, so the homeowner and team has all the facts. This means, too, that conservation performance becomes an objective for remodels. There are times when not bigger but better is the answer. If the space is adequate in size, it still may not be what the homeowner wants, so an update is in order. Jeff Williams recounts a similar situation for a client with a rustic log- accented home. “The client loved the spaces, but the interior needed a lot of work.” In this case, Williams and the client worked with Rob McGowan of Architectural Resources to develop a “modern meets rustic” kitchen. 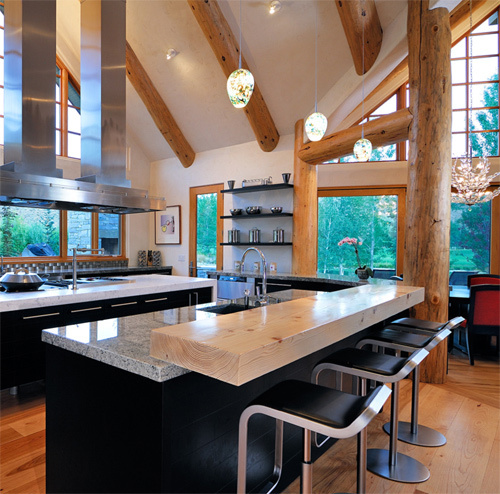 The result is a spacious uncluttered kitchen with horizontal view planes to the ample uncovered windows, more counter space than a crazed caterer could clutter, the shimmer of metal and polished stones, and simple clean lines juxtaposed against the natural idiosyncrasies of the logs. Wherever the remodeling decision path may lead, with professional assistance the possibilities are endless, but our experts say to plan on plenty of planning. In future issues, Western Home Journal will return to and expand on the subject of remodeling with assistance from experts. The heart of conservation is reuse, and remodeling revitalizes homes for continued enjoyment.